Pic(k) of the week 21: Concrete jungle? 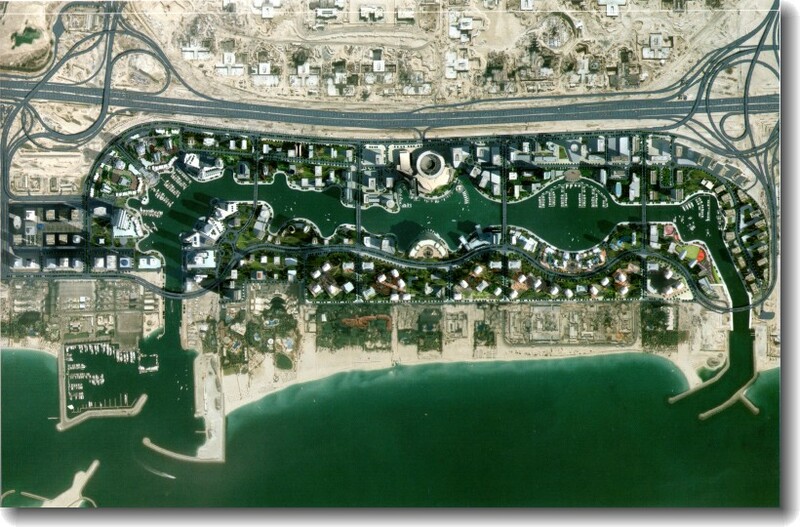 Dubai Marina is a man-made Marina on the West side of Dubai and often referred to as the "New Dubai". The project consists of more than 100 Skyscrapers. Most of the towers are either finished or in the final stages of completion. However, it is likely that with the current financial crisis, some of the towers will not be built or will at least be delayed for a considerable time. 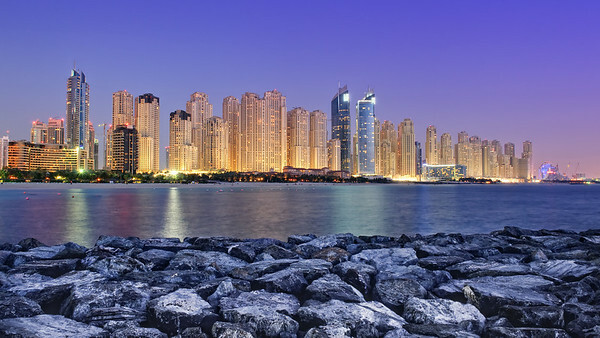 The one mile long sea-facing Jumeirah Beach Residences, is the largest single phase residential development in the world consisting of 40 towers. The project is sometimes also referred to as the "Concrete jungle"! I shot some night cityscapes of the Marina project from a reclaimed piece of land next to the Al Habtoor hotel. More images can be found here. The light turned out nice about 20 to 30 minutes after sunset. A few clouds would have made things perfect... but this is Dubai! Tomorrow, I'm planning to jump on an Airbus A380 to Paris and spend the next 10 days in Belgium. Taking quite a bit of camera gear with me, I should be able to shoot some Urban photography in my home country. Since my day-job has kept me very busy last week, this must be the first time in over a year that I haven't touched my camera in about 8 days... shame on me! Having said this, I did get around updating my Aviation Portfolio page, by re-editing quite a few of my Airventure 2008 images. I'm of big fan of always keeping your original RAW (NEF) files, in order to re-edit them when better software or RAW processing programs become available. For the non-aviation fans, EAA (Experimental Aviation Association) Airventure is the worlds largest Aviation event held every summer in Oshkosh, Wisconsin (USA). A weeklong happening with more than 3/4 of a million visitors and over 15000 aircraft on display. A Mecca for Aviation! I attended the event for the first time in 2008 and will surely be back in the future! Amongst the many Warbirds was this very nice Sea Fury called Riff Raff. The aircraft built in 1957, has been racing at the Reno Air Races as nr 99 and belongs to the top 10 of the fastest prop aircraft in the world . If interested you can follow me on Facebook and Twitter. A few days ago, I went to one of my favorite people shooting places in Dubai, "Deira fish market". It is a buzzing daily market selling mostly fish and seafood but also a good collection of fruit and vegetables. It looks like I'll be delivering the next batch of 4x6's to the fish-market guys in the coming weeks... a tradition to keep up with! To see some of these images visit the Dubai Daily Life gallery. Last week I paid another visit to the Sheikh Zayed Bin Sultan Al Nahyan Mosque in the capital of the UAE. It was the third time I visited this Architectural masterpiece at the outskirts of Abu Dhabi. I specifically wanted to shoot HDR (High Dynamic Range) images of the interior and the outside just after sunset. A cloudy sky, which is quite unique in the region, made for an excellent backdrop. 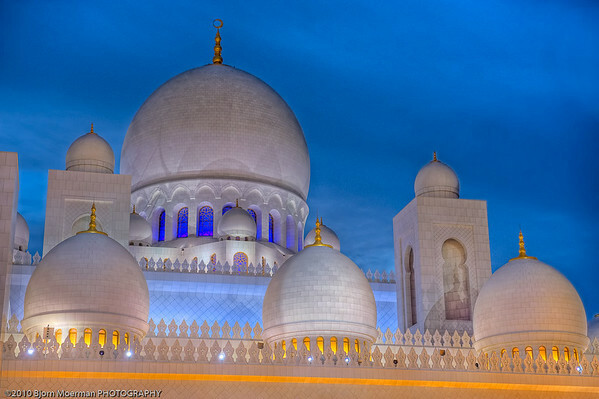 Sheikh Zayed Mosque, also known as the Grand Mosque, is the largest in the UAE and the 8th largest in the world. 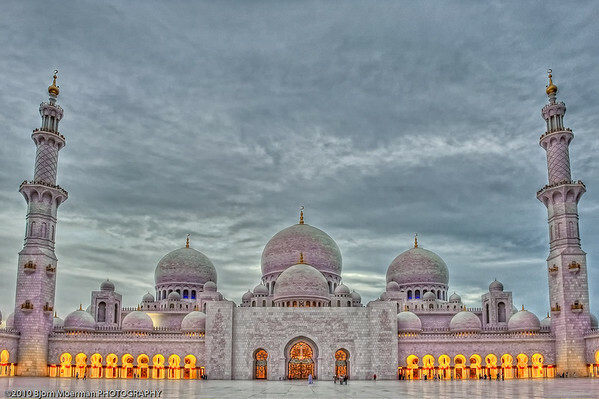 It is named after Sheikh Zayed bin Sultan AL Nahyan, the founder and the first President of the United Arab Emirates, who is also buried at the site. 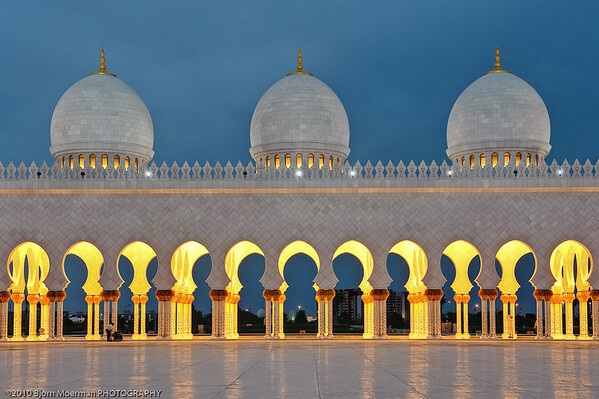 The design has been inspired by Mughal and Moorish mosque architecture, the Badshahi Mosque in Lahore and the Hassan II Mosque in Casablanca being direct influences. Its archways are Moorish and its minarets are classically Arab. The whole design of the building can be best described as a Fusion of Arab, Mughal and Moorish architecure. The Mosque is large enough to accommodate 40000 people. The main prayer hall gives places to 9000 worshippers, while 2 women only rooms next to it, can accommodate 3000 people. 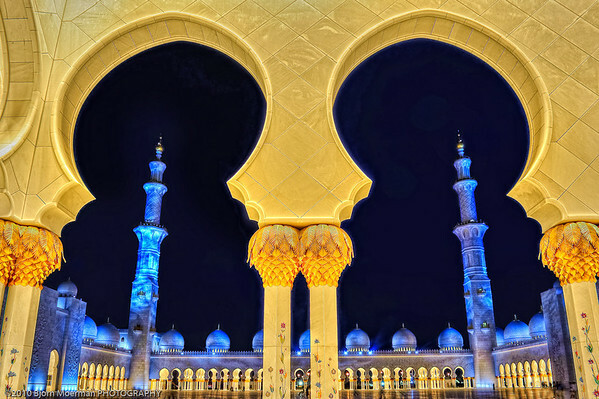 There are four minarets at the corners of the Mosque which rise to 115m (377ft). 57 Domes cover the 17000 sqm outside yard and the main buildings. These domes are decorated with white marble as is the interior decoration. The carpet laid out on the vast expanse is the World's largest carpet, designed by Iranian artist Ali Khaliqi and made by Iran's Carpet Company.It measures 5627 sqm and was made by about 1200 weavers and technicians. The weight of the carper is 47 metric tons and has an estimated 2.268.000.000 knots. The Mosque also holds the largest Chandelier (10m diameter and 15m height), made in Germany and plated with Gold and Copper. 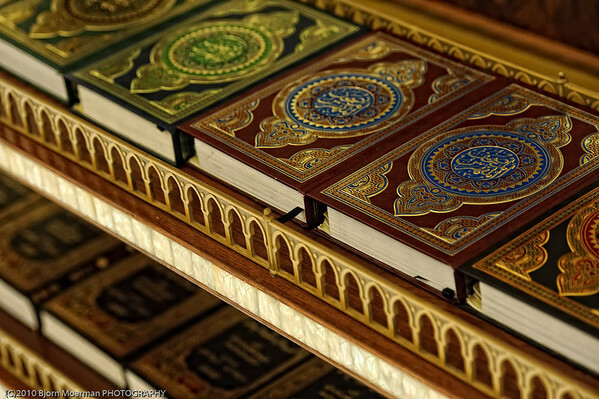 Anybody can visit the Mosque. For more info please refer to their website. Driving up North from Dubai to Ras Al Khaimah along the coastal road, you'll pass the small general aviation airport of Umm Al Quwain (OMUQ). A Russian built Iluyshin IL-76 TD sits outside the main building and is used as an advertising aid for the Palm Beach Hotel next door. A Russian workhorse as a huge billboard! The Soviet built passenger and cargo aircraft (Serial number 053403072), was built and delivered to the Soviet air force some time around 1982, registered as CCCP-86715. After the Soviet Union fell apart, the Russian air force retained the jet and reregistered it RA-86715. It continued to fly for the Russian air force until the early 90’s, when it was sold to Sharjah-based Air Cess and subsequently reregistered EL-RDT. Air Cess, in turn, sold the plane to AirPass in Swaziland and the plane was reregistered 3D-RTT until they, in turn, sold the plane to Centrafrican Airlines in the Central African Republic who re-registered the plane for the last time; TL-ACN. The Il-76 is known as a Russian workhorse and a lot of other examples still fly in the UAE skies on a daily basis. How did the aircraft get to its final resting place? Even though aircraft have landed at the wrong airports before, the more plausible story is that the aircraft made its last flight voluntary to Umm Al Quwain to be scraped after that. When looking at it now, it’s hard to believe this was a fully airworthy aircraft just 11 years ago. The plane was subsequently deregistered and over the years stripped of any element worth more than 2 dirham. The scorching sun and sand did the rest. There are some vague plans to convert the plane into a restaurant, but so far, nothing serious has materialized yet. Last but not least, I've recently opened a Bjorn Moerman PHOTOGRAPHY Facebook page. Feel free to subscribe here if interested.